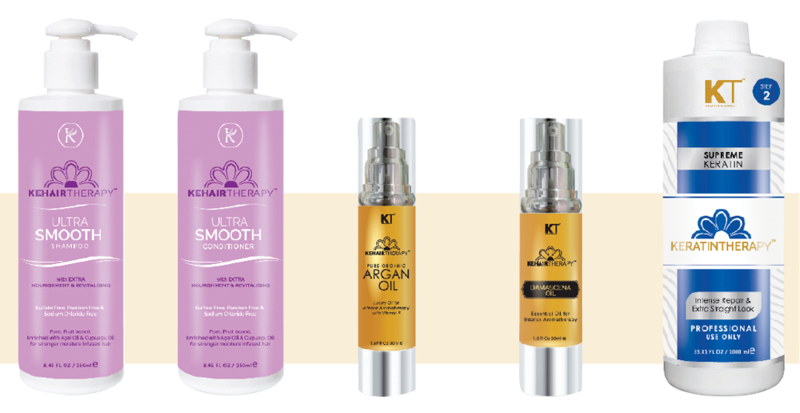 With a wide range of products for in-salon services and extended in-salon use products for aftercare, the professional hair care brand, Kehairtherapy offers a complete solution to all hair texture and types. Packed with fruits and other powerful botanicals, this hair shampoo is perfect for every hair type. With antioxidant and vitamin-rich, Acai Oil and Cupuacu Oil, this exotic and sulfate-free shampoo claim to intensely hydrate, soften and bring back a natural shine. The ingredients help to prevent split-ends, prolong the life of hair colour, provide great frizz control, restore damaged hair and protect against UV ray damage, and improve scalp health. With antioxidant and vitamin-rich Acai Oil and Cupuacu Oil, the Ultra Smooth Conditioner helps repair and protect damaged hair. This unique formulation provides deep hydration to hair, leaving it soft and smooth. Works for sensitive scalp and helps balance and restore hair with deep-rooted frizz control. Kehairtherapy Argan Oil Hair Masque is enriched with proteins and Keratin and is also infused with Argan Oil, derived from the Moroccan Argan tree. Its moisturising properties help to revive and nourish trying damaged hair. The hair masque is an intensive treatment that helps rebuild strength and restore elasticity in all hair types. It is specially formulated to help improve texture and manageability leaving hair looking healthier shinier. Kehairtherapy Damascena Oil is an aromatherapy oil with natural extracts of Bulgarian Rose that nourishes, balances and conditions the hair. It soothes the scalp, adds luster, moisture, and strength to the hair. It helps to prevent hair breakage and improves hair texture. On coloured hair, it helps the colour last longer and it stimulates the scalp and helps promote blood circulation. Keratin Infused Deep Conditioning Masque is an intense, nourishing and hydrating treatment that revives hair that has been dried or damaged by the environment or styling stresses. Jojoba, walnut and chestnut oils penetrate deeply into the hair, resulting in unparalleled moisture, strength, elasticity and brilliant shine. Kehairtherapy Professional was introduced in India by Ccigmaa Lifestyles in 2016 with product formulation from the USA. It brings to you an all-inclusive range of hair care products of the superior quality.